Cleaning your home is now easier than ever before with the LG Roboking Vacuum cleaner (a.k.a Hom-Bot). LG Roboking vacuum cleaner is a robotic cleaner that does the cleaning on its own with little or no human aid. Automatic vacuum cleaners like the LG 6710LVM create a map of your home using its built-in sensors and camera and with it creates an efficient path for keeping your home clean. The LG 6710LVM Roboking Vacuum cleaner cleans your home while you do other stuff like watching TV or reading this article. Using its dual camera (dual-eye) it calculates the space in the room and creates a map of the room, then it works out an efficient path for cleaning the room all by itself. 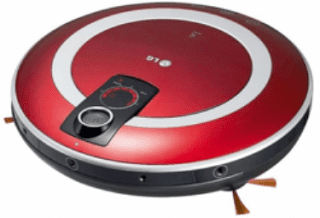 While cleaning the LG Roboking Vacuum cleaners are smart enough to avoid obstacles. The LG 6710LVM vacuum cleaner is just 90mm high, making cleaning underneath furniture easy. It can also clean edges and corners using its side brushes. You can also use remote control give commands to the robot as well as schedule when you want the cleaning to begin. The LG Robot vacuum cleaner can be scheduled for cleaning from 1 to 12 hours ahead of time. The Vacuum cleaner is also smart enough to dock itself for charging when its battery goes down. The LG Hom-Bot vacuum cleaner sweeps and vaccums at the same time. The main brush loosens the dirt and dust on the floor for easy vacuum. The side brushes handles difficult to clean areas like wall edges. The hygienic dust bag is easy to lift off from the top of the vacuum cleaner. LG Roboking Vacuum cleaner also feature a HEPA filter that captures dust, mites, pollens, and other allergens for hygienic cleaning. The LG Roboking vacuum cleaner (LG 6710LVM Robot) is currently available in Nigeria at a price range of N108,000 to N117,000. It is available in red.